Navigating at Sea is an immersive environment that suggests a walk through a 19th-century sailing vessel. Navigating in the Air relates how air navigators struggled with greater speeds, worse weather, and more cramped conditions than their sea-going predecessors. 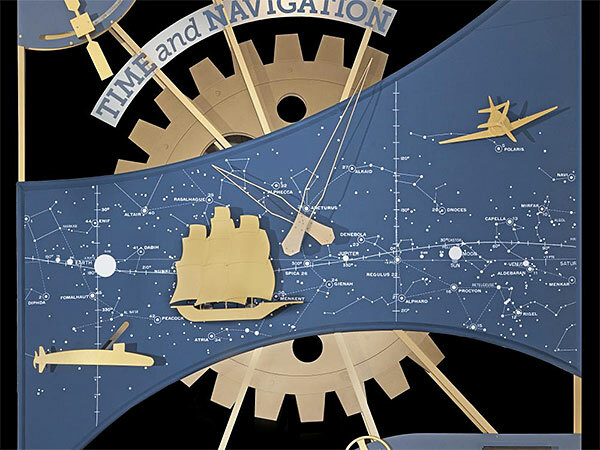 Navigating in Space traces how teams of talented engineers invented the new science of space navigation using star sightings, precise timing, and radio communications. Inventing Satellite Navigation describes how traveling in space inspired plans to navigate from space. Navigation for Everyone tells the stories of real people—a fireman, a farmer, and a student—who use modern navigation technology in their everyday lives and addresses what might come next. Presented in collaboration with the National Museum of American History.